On this day in 1913, Edinburgh Zoo opened its doors for the first time. Edinburgh Zoo was founded by the Royal Zoological Society in the Corstorphine hill area, opening after just 15 weeks of work. The park was created by Thomas Haining Gillespie, a solicitor from Dumfries. Despite the failure of Edinburgh’s previous zoo, the Royal Zoological Gardens, Gillespie’s ultimate goal was to successfuly house tropical animals. He soon formed the city’s Royal Zoological Society and began plans for Edinburgh Zoo. Searching for an appropriate site, the Zoological society desired a location which was widely and inexpensively accessible for the public, one which had minimal wind and maximum sun. 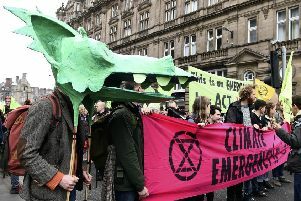 The Zoological society was faced with financial difficulties so it was Edinburgh Council who purchased the 75-acre Costorphine Hill House estate for around £17,000 and allowed the society full use of the grounds in return for a small repayment fee each year. On July 12 1913, a menagerie of animals were delivered. Travelling boxes were loaded onto lorries which formed a procession along Costorphine Road, with two camels bringing up the rear. The first-ever arrival to be housed at the zoo was a gannet swifted followed by penguins. Three King Penguins were brought over from South Georgia with Charles Salverson’s whaling expedition which docked in Leith. Edinburgh’s penguins were the first penguins ever to have been seen outside the South Atlantic with the zoo’s first King Penguin chick hatching in 1919. Penguins continued to arrive in Edinburgh from whaling expeditions and soon became some of the zoo’s most popular animals. Its King penguins remain as popular as ever today, with many of the zoo’s penguins performing a parade around the zoo each day. The daily performance first occured in the 1950’s when, after accidently leaving a gate open, a zoo keeper was followed around the park by a train of escaped penguins. This spectacle caused visitors such amusement that the Penguin Parade was established soon after and continues to this day. During the Second World War, Edinburgh Zoo was bombed twice, and although only one report of a giraffe killed exists, the zoo was nervous that enclosures housing dangerous animals may be damaged causing a threat to the public. For this reason, some animals, including a newly introduced wolf pack, were euthanised. He lived an incredible life before retiring to Edinburgh Zoo. Having been adopted as a cub by the 22nd Company Polish Army Service and Corps, he was enlisted in 1944 as an honorary soldier, with his own number and rank. Wojtek travelled to the Battle of Cassino with his troops and, reportedly unprompted, helped to carry 25lb cases of artillery shells for his comrades while under heavy fire. After the war the Polish Company was billeted in Beriwckshire, before coming to Edinburgh Zoo. Wojtek was not Edinburgh’s only animal tie to the military. Norweigan links to Edinburgh Zoo began when the first penguins were brought over by the Salveson family, and in 1972 a visiting leiutenant who was part of the Norweigan King’s guard adopeted a King penguin. The penguin in question, named Nils Olav, was given the rank of lance corporal. A statue of Olav still stands outside the entrance to the zoo. The zoological park was the first and remains the only zoo in the UK to be incorporated by Royal Charter, and was also the first zoo in the world to house and breed penguins.